When we decided to work our way through Italy, it was a pretty rash decision full of ‘so do you fancy it?’ ‘Well, when are you free?’ ‘Sounds good, shall we just book it?’ Flights were booked in a mere twenty minutes, trains a week or so later and there we were, a country at the end of our fingertips but nowhere to lay our heads at night. Accommodation always increases the budget, which is why night-time travel on planes and trains is always a great idea. Hotels were extortionate (it was summer) and when you’re staying for no more than two nights it gets even pricier. Then we found a campsite where no camping equipment was required. 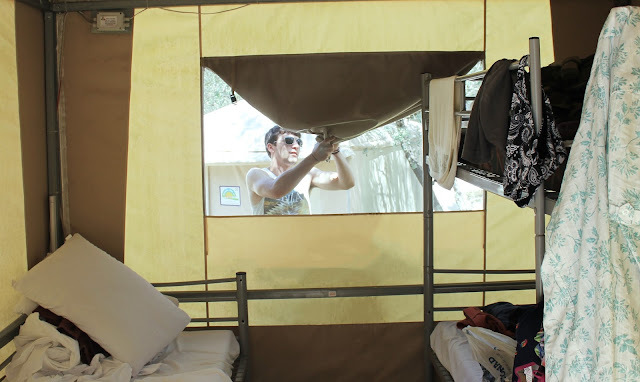 You turn up, they hand you a tent (with a bed and some sheets) and you pay before you leave. It cost us an average of £8 per night and despite the extremely close proximity to your camping buddies, it was pretty fun. N.B. I am a somewhat comfortable without household luxuries. I once spent a night in a hut opposite a lake full of alligators and thought it was magical. Most people I know hate camping, but when you’re on a budget, it’s a question of staying longer in less luxurious conditions, or cutting your adventure short for a nicer place to rest. The truth is, after a few nights of sleeping in a tent, you start to forget what a house is even like. Any type of brick structure will become a luxury, you stop and stand still at shop entrances when you feel air conditioning hit your body and thunderstorms will become more exciting than ever before. Within time, mosquito’s will even become your friends. I joke, mosquito’s don’t have friends. Don’t forget flip flops, going bare foot in communal showers is a health hazard. Attach something colourful to the front of your tent, I can imagine it would be slightly awkward if you walked into the wrong one and got into bed with a stranger. In the event of a thunderstorm, pull everything off the floor in an efficient military manner. Remember if you’re using your phone as a flashlight, to turn it off before you get changed. Take ear plugs, most campers will be young and fun, but they also like a good party. If you ignore all else, remember this. Take copious amounts of mosquito spray and throw it over yourself like confetti. Also take bite cream and anti-histamine (take enough for twice as long as you’ll be gone). Mosquito’s take no prisoners and they like camping too.